In view of new civilizational challenges of the 21st century, health promotion and education encouraging active participation in physical recreation, which should be implemented at all levels of education, within family, peer environment and local environment, become issues of particular importance. The research was carried out in the summer of 2013 and included 572 students of John Paul II State School of Higher Education in Biała Podlaska (PSW), of such degree courses as Tourism and Recreation, Public Health, Nursing, Rescue Medicine and Computer Science. The method used in the research was a diagnostic survey based on International Physical Activity Questionnaire (IPAQ). The aim of the study was to get to know the differentiation between the forms of recreational physical activity taken up and expected by the students of PWS and their gender, BMI and self-assessment of physical fitness. Basing on the results of the analysis it was concluded that the abovementioned independent variables have significant impact on the forms of physical activity chosen and expected by the surveyed. Studies of the literature on the subject and the results of our previous research entitle us to conclude that university students, who in the near future will constitute the intellectual elite of the country, should be aware of the influence of physical activity on general health, the importance of healthy lifestyle and their role in promoting healthy attitudes. However, the research showed that the students are not ready to perform such tasks, therefore the actions preparing them to lead a healthy lifestyle need to be intensified. 1. Altallah L., Leong JJ., Lo B., Yang G.Z. Energy expenditure prediction using a miniaturized ear-worn sensor. Medicine and Science in Sports and Exercise. 2011; 43: 1369–1377. 2. Bergier B., Bergier J., Wojtyła A. Various aspects of physical activity among Lithuanian adolescents. Annals of Agricultural and Environmental Medicine. 2012; 19: 4: 825–829. 3. Bergier B., Niźnikowska E., Stępień E., Szepeluk A., Bergier J. Aktywność fizyczna studentów a ich czas wolny i samoocena sprawności fizycznej. Antropomotoryka. 2013; 23: 64: 41–47. 4. Bergier B., Stępień E., Niźnikowska E., Bergier J. Aktywność fizyczna kobiet i mężczyzn studiujących w Państwowej Szkole Wyższej w Białej Podlaskiej. Medycyna Ogólna i Nauki o Zdowiu. 2014; 20: 2: 166–170. 5. Bergier J., Kapka-Skrzypczak L., Bilinski P., Paprzycki P., Wojtyła A. Physical activity of Polish adolescents and young adults according to IPAQ: a population based study. Annals of Agricultural and Environmental Medicine. 2012; 19 (1): 109–115. 6. Biernat E. Aktywność fizyczna mieszkańców Warszawy na przykładzie wybranych grup zawodowych. Szkoła Główna Handlowa. 2011. 7. Blair S., Cheng Y., Holder J. Is physical activity Or physical fitness more import ant in defining health benefits? Med Sci Sport Exerc. 2001; 33: 379–399. 8. Feedson P., Bowles HR., Troiano R., Haskell W. Assessment of physical activity using wearable monitors: recommendations for monitor calibration and usa in the field. Medicine and Science in Sports and Exercise. 2012; 44 (1): 1–4. 9. Gomez L.F. Duperly J., Lucumí D.I., Gámez R., Venegas A.S.Physical activity levels in adults living in Bogota (Columbia): prevalence and associated factors. Gac Sanit. 2005; 19: 206–213. 10. Hallal P.C., Victoria C.G.,Wells J.C., Lima R.C. Physical activity: prevalence and associated variables in Brazilian adults. Med. Sci. Sport Exer. 2003; 35: 1894–1900. 11. Jeżewska-Zychowicz M. Wpływ wybranych cech indywidualnych i środowiskowych na zachowania żywieniowe młodzieży. Wydawnictwo SGGW Warszawa. 2006: 10–12. 12. Markiewicz-Górka I., Korneluk J., Pirogowicz I. Aktywność fizyczna oraz wiedza studentów Akademii Medycznej we Wrocławiu na temat jej roli w profilaktyce chorób – badania ankietowe. Family Medicine &amp; Primary Care Review. 2011; 13: 436–439. 13. Mędrela-Kuder E. Ocena stylu życia studentów fizjoterapii i edukacji techniczno-informatycznej na podstawie żywienia i aktywności fizycznej. Rocznik PZH. 2011; 3: 315–318. 14. Mynarski W., Rozpara M., Czapla K., Garbaciak W. Aerobic Capacity of studenst with Different Levels of Physical Activity as Assessed by IPAQ. Journal of Human Kineticis. 2009; 21: 89–96. 15. Myszkowska- Ryciak J., Kraśniewska A., Harton A., Gajewska D. Porównanie wybranych zachowań żywieniowych studentek Akademii Wychowania fizycznego i Szkoły Głównej Gospodarstwa Wiejskiego w Warszawie. Probl Hig Epidemiol. 2011; 91 (4): 931–934. 16. Niźnikowska E., Bergier J., Bergier B., Stępień E. The year of study and the physical activity of students Fields of study at State School of Higher Education in Biała Podlaska. 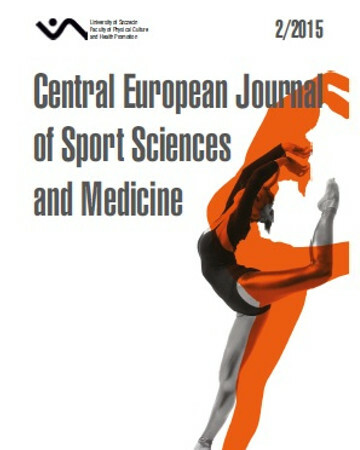 Central European Journal of Sport Science and Medicine. 2014; 6 (2): 67–75. 17. Sebastiao E., Gobbi S., Chodzko-Zajko W., Schwindel A., Papini C.B., Nakamura P.M. The International Physical Activity Questionnairelong form overestimates, self-reported physical activity of Brazilian adults. Public Health. 2012; 126 (11): 967–975. 18. Seń M., Zacharczuk A., Lintowska A. Zachowania żywieniowe studentów wybranych uczelni wrocławskich a wiedza na temat skutków zdrowotnych nieprawidłowego żywienia. Piel Zdr Publ. 2012; 2 (2): 113–123. 19. Shephard R.J., Aoyagi Y. Objective monitoring of physical activity in older adults: clinical and practical implications. Physical Therapy Reviews. 2010; 15: 170–182. 20. Sochocka L., Wojtyłko A. Physical activity students of the medical and non-medical degree courses. Medycyna Środowiskowa – Environmental Medicine. 2013; 16: 2: 53–58. 21. Sokołowski M., Kaiser A., Cepulenas A. Physical activity of female students of the University School of Physical Education in Poznań on the basis of IPAQ – educational and social perspectives. Ugdymas Kuno Kultura Sportas. 2010; 3 (78): 90–95. 22. Stępień E., Bergier B., Bergier J., Niźnikowska E. The relationship between the level of physical activity of students and the direction of their studies. Medycyna Sportowa/Polish J Sport Med. 2014; 3 (4): 30, 189–198. 23. StudentBus: Cykliczne badania studentów. Student News, Instytut Socjologii UW. Warszawa XI 2004. 24. Winiarska-Mieczan A., Dymek T. Ocena aktywności fizycznej wśród młodzieży akademickiej lubelskich uczelni. Medycyna Sportowa. 2009; 2 (6): 125–131.